Improve the beauty and value of your home when you take advantage of the services at our popular flooring store. We offer a wide selection of materials ranging from carpet to hardwood to ceramic tile flooring. So no matter what type of floors you want in your home, you can find exactly what you are looking for. Our experts help you choose the luxurious flooring options that will match your home’s décor perfectly. Not only will your new floors create a more elegant atmosphere for you to enjoy, but they can also be an attractive feature for potential homebuyers if and when you want to sell. If you want to install tile in your kitchen, bathroom, or even your entire house, our professionals are here to provide high-quality services from start to finish. We walk you through your options to help you select your ideal ceramic floor tile, offer superior ceramic tile installation services, and back our work up with top-notch warranties. Why settle for anything less than the best? By relying on our expert staff for your ceramic tile needs, your satisfaction is guaranteed. Because we are committed to our customers’ happiness, we take the time to match you to your perfect tile match. Our installation staff works diligently to give you your dream floors on schedule. To top it all off, if you don’t absolutely love your ceramic tile floors, we will reinstall new floors for free. 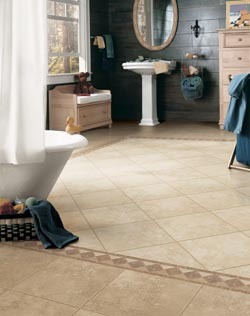 Ceramic floors are an elegant option for any area in your home. However, this material does more than just look great—it also helps keep you and your family healthy. No matter what size, shape, or color you choose from our vast inventory of ceramic tile flooring, each option gives you a smooth surface that doesn’t trap allergy-worsening dirt and dust. The very method of making ceramic tiles contributes to its overall health factor. Ceramic is made in high-temperature kilns that eradicate all volatile organic compounds within the material. Because these compounds no longer exist in the tiles, they can’t be released into the air, which means your whole home has cleaner, more breathable air. Ensure the beauty of your floors lasts for decades. Ceramic floor tile is a material that stands up to the wear and tear of daily life extremely well. We make sure your floors last as long as possible by providing top name brands, such as Daltile and Happy Floors, and providing warranties that cover your floors for up to 25 years. The beauty of your floors not only lasts for decades, but is also extremely easy to maintain. When you take advantage of our ceramic tile installation services, we ensure your floors are properly sealed. This allows you to clean them with simple sweeping and mopping, allowing you to cut down on your cleaning time without compromising on your home’s style. Contact us today to learn more about our ceramic tile flooring products and services. We proudly serve customers in and around Worcester, Massachusetts.